. 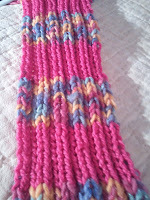 Knit So Simple: Day Four . . and nothing's complete yet! Day Four . . and nothing's complete yet! All the grandiose knitting plans for Spring Break '11 are still just sticks and string dreams .... nothing really completed yet ... lots of plans still lingering, still wrapped around my needles, but not bound off yet. However, i'm a firm believer in that "YET" word ... because it's still 3 more days until that Monday morning school bell rings at 7:50 A.M.
1) i STARTED on a new hat using taupe and inserting a black stripe every 3 rows ... and i'm liking my 'jogless join' technique i've learned from the pattern. i LOVE this yarn! Bernat "Jaquard"
that does ALL the work for you! 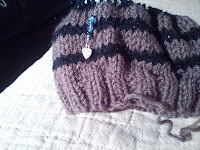 3) using the same yarn as the mit, i was feeling very sassy so i just found a hat pattern and started knitting for a baby hat .... and because i was so intrigued with the yarn i failed to do the 'reality' check .... 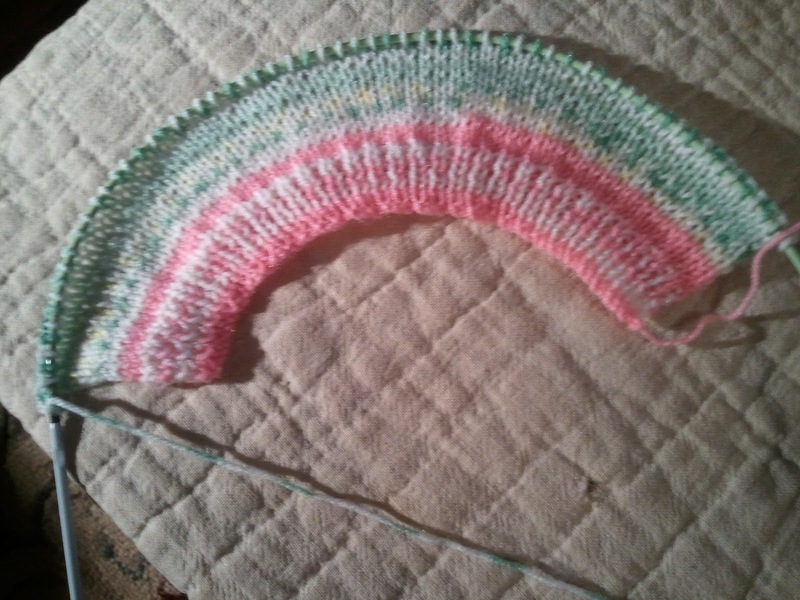 i.e., i didn't check gauge for probably 4" worth of knitting but OOOOO, it looked so pretty!!! it won't HOWEVER, fit around a baby's head! guess this is where i realize that i should have worked harder on those 'word problems' in math! Basically, my gauge is 5 stitches per inch ... and i cast on 64 stitches which translates into a circumference of alMOST 13" ... but wait! an average baby head is 15" so ..... can you say rip it out! good thing i like this yarn and that it holds my interest!!! 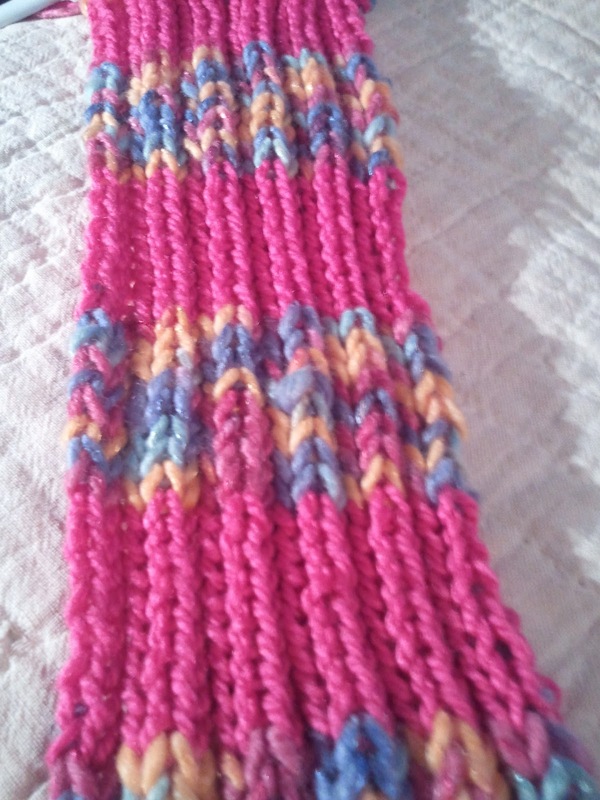 4) i have an 'order' for a scarf ... bright bold colors .... but the more i've talked with her the more i realize it needs to be a 'safe' kind of bold ... so i'm opting for a K2, P2 ribbed knit scarf in color blocks ... solid pink blocks alternating with variegated blocks .... BUT i think i'm going to vary the blocks . . 8 rows each, then 6 rows each, then 4 rows each, and then 2 rows each . . and then back out again! and it WILL be finished and ready for delivery on Monday! F I N I S H E D!!! Because I said so . . .